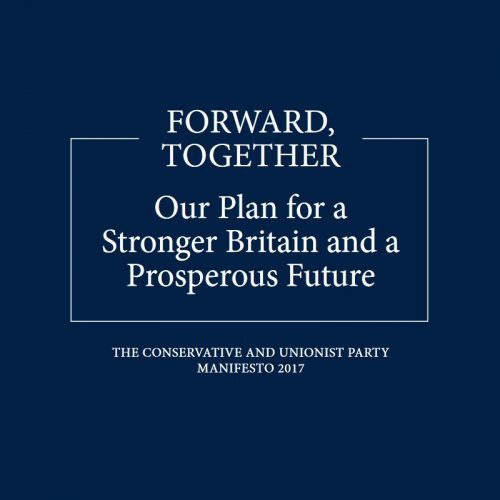 The Conservative Manifesto 2017 was released 18th May 2017. You can view the PDF version in full at Conservative Manifesto 2017. I believe our United Kingdom can emerge from this period of great national change stronger and more prosperous than ever before. I believe we can be a country that stands tall in the world and provides leadership on some of the greatest challenges of our time. I believe we can – and must – take this opportunity to build a Great Meritocracy here in Britain. A Britain in which every area is able to prosper, with a modern industrial strategy to spread opportunity across the whole United Kingdom. A Britain in which work pays, with a higher national living wage and proper rights and protections at work. A Britain in which the economy is strong to support world-class public services, with the most ambitious programme of investment in people, technology and buildings the NHS has ever seen; record – and fair – funding for schools; and the first ever proper plan to pay for – and provide – social care. And a Britain in which burning injustices are tackled and overcome, with the first new Mental Health Bill for thirty years to put parity of esteem at the heart of treatment and end the stigma of mental illness once and for all. None of this will be easy. It will require discipline and focus, effort and hard work. It will require leadership from a government that is strong enough to stand up for Britain, and stable enough to steer the country safely through the negotiations ahead. Above all, it will require a unity of purpose stretching across this precious union of nations, from north to south and east to west. For as we embark on the momentous journey ahead of us over the next few years, our shared values, interests and ambitions can – and must – bring us together as a united country. 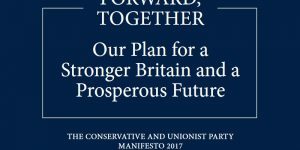 Compare the 2017 Conservative Party manifesto with the 2015 manifesto, download the Conservative Manifesto 2015 PDF Format.